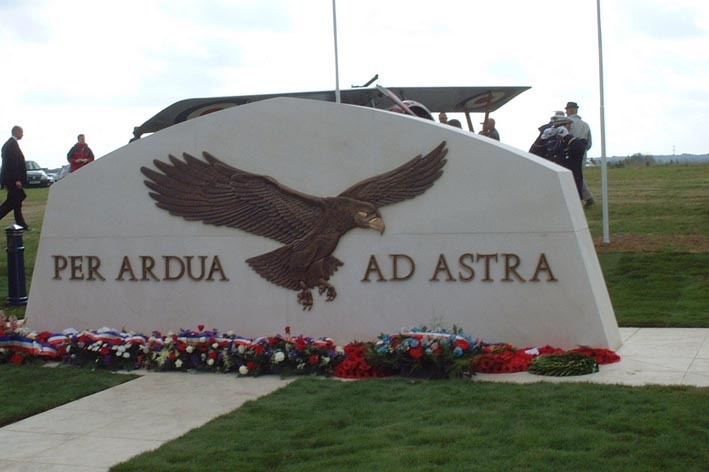 The St Omer Appeal has raised funds for a memorial to be erected to the memory of the RFC, RNAS, RAF and AFC personnel who served in France during the First World War. The memorial (below) was unveiled at the aerodrome, Longuenesse, St Omer, on 11 September 2004. St Omer was, for much of the First World War, the Headquarters of the Royal Flying Corps in France. Many of the Squadrons deployed in France passed through St Omer airfield. The ARRAS FLYING SERVICES MEMORIAL commemorates nearly a 1,000 airmen of the Royal Naval Air Service, the Royal Flying Corps, and the Royal Air Force, either by attachment from other arms of the forces of the Commonwealth or by original enlistment, who were killed on the Western Front and who have no known grave. The Arras Flying Services Memorial is in the Faubourg-d'Amiens Cemetery, Boulevard du General de Gaulle in the western part of the town of Arras. The cemetery is near the Citadel, approximately 2 kilometres due west of the railway station.